This steaming blue-green lake in Nakadake’s crater is Aso’s biggest attraction, but beware of the noxious gases and unpredictable eruptions. Aso is one hell of a volcano. 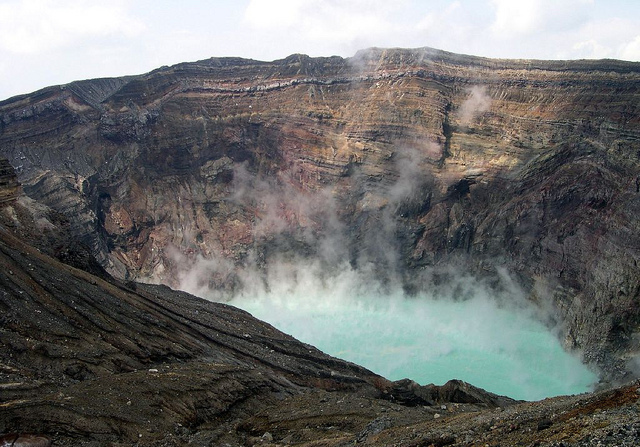 Its crater is 25km from north to south, and 18km wide. The last eruption of this giant crater was 90,000 years ago, when flows of hot gas and rocks spread over half of Kyushu. Fortunately, more recent eruptions have been on a much smaller scale, and have formed a group of more normal-sized volcanoes in the centre of Aso’s crater. One of these peaks, Nakadake, is still active. Despite the danger of eruptions, there are several towns within the main crater, the biggest of which is itself called Aso, and a train line that goes right across the crater from East to West. It’s possible to drive all the way up Nakadake to the rim of the crater, from where you can look down into a steaming blue-green lake. Looking outwards, you can see the walls of the outer crater far off in all directions. The volcano continuously emits toxic gases, so if the winds are blowing in the wrong direction you won’t be able to go up. As Nakadake sometimes throws out rocks without warning, there are concrete shelters around the rim where you can take refuge if necessary. Very occasionally tourists have been killed by sudden eruptions, but the risks are very small – so don’t let this put you off a unique opportunity to experience our planet’s dynamic geology first-hand. This hill might not look natural, but it is. 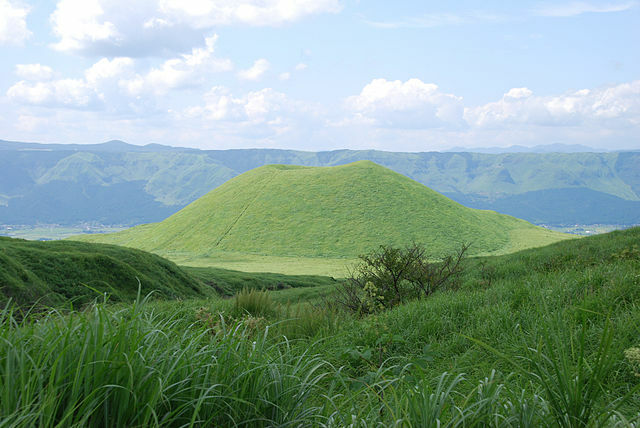 It’s called Kome Zuka, meaning ‘rice mound’, and is a volcanic cone that last erupted about 200 AD. The hills in the distance are the walls of Aso’s giant crater. If you’re using public transport, you can reach the town of Aso from Kumamoto (on the Kyushu Shinkansen line) in 67 minutes by express train. If you’re coming from the east side of Kyushu, Aso is 106 minutes from Oita, again on an express. Services are not very frequent, so use this website to check times in advance. From Aso station, there is a bus that takes you most of the way up Nakadake. You can then either complete the trip to the top in a cable car, or just walk to the summit (it only takes 20 minutes or so). Buses run around once an hour, seven days a week. Going up the first bus leaves at 9:10am and the last bus is at 3:40pm, and coming back down, buses run from 9:55am until 5pm. Buses also stop at the Aso Volcano Museum halfway up the mountain. Detailed transport information is available here.